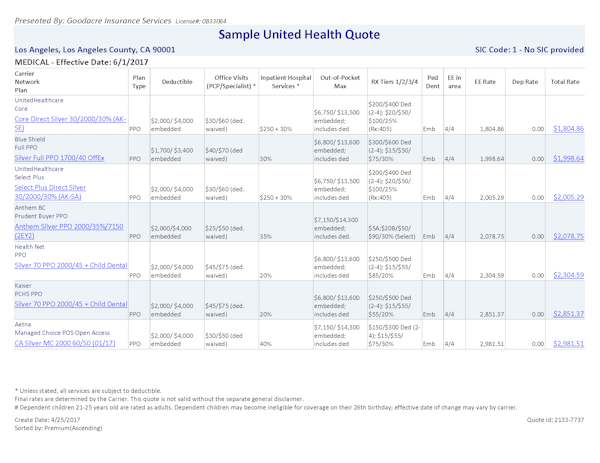 United Health Pricing for California Group Health Excites! The last few years have seen California small companies running for cover. Cover from spiraling health insurance costs, new rules, mandates, and penalties. As we help small businesses (1 - 100 employees) navigate this sea of rate peril, occasionally we get some good news. This is one of those times and we're very excited. Which is hard to do with group health benefits. We run proposals for companies all day long. You do enough of these and you see patterns and opportunities. Ways for company to save and still offer health benefits that their employees actually value. United Health is our current favorite flavor and we'll explain why. Otherwise, let's pull back the cover and see what's there. Group health premiums have roughly doubled or tripled in the last few years. Many companies we speak with our close to the point of throwing in the towel. They know health benefits attract and retain good employees but there's a point where it's too expensive. 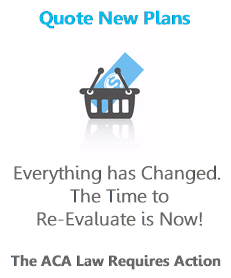 That's why we're so attuned to market changes when we run quote for companies. 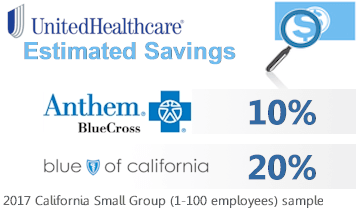 In many areas, we consistently see United health PPO come in 10% less than Anthem and 20% less than Blue Shield. Those are two of biggest insurers out there on the group market. 20% is a big number especially since Blue Shield was so aggressive over the past few years in attracting California small businesses. There are 10's of 1000's of companies out there who may be paying 20% more for comparable coverage. Remember...the plans are standardized now. A silver plan has to match a silver plan +/- 2% in benefits. They can add to one benefit but they have to take away from somewhere else. That's just the way it works now. So PPO's beating all the major carriers in most cases (Anthem Blue Cross, Blue Shield of California, Health Net, Aetna, Covered California, Cal Choice, etc). Here's a look at a sample group quote with 4 employees (age 25, 35, 45, and 55) across the full PPO networks plus United's slimmer Core network (more on that later). Their HMO is also beating most other carriers except for 1. Kaiser. Don't fret. We can actually have the best of both worlds with Kaiser. What we're doing is called a Kaiser wrap. We can offer United PPO's and HMO's along side Kaiser. It's the best of both worlds for group health benefits. 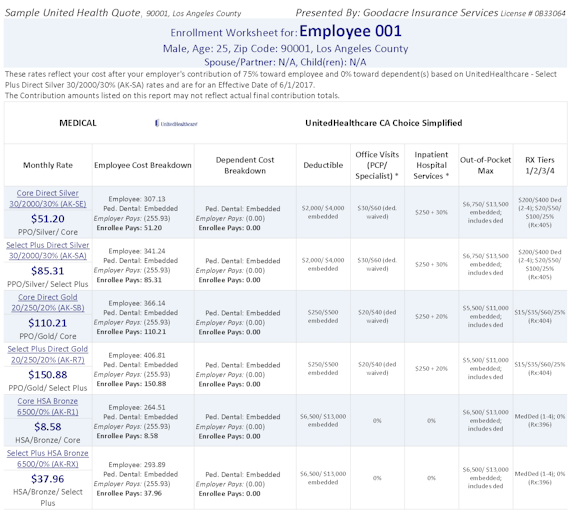 Some employees love Kaiser OR they want the lowest priced plan at a given benefit level. Others want to keep their doctors that they may have relationships with spanning decades. No problem. We can offer United PPO and HMO with Kaiser. All one clean package to your employees. For California companies, we just need 5 employees to go with United to do the Kaiser wrap. We make it seamless and we'll explain that as well below when we quote it for you. So what about the networks for United group health? 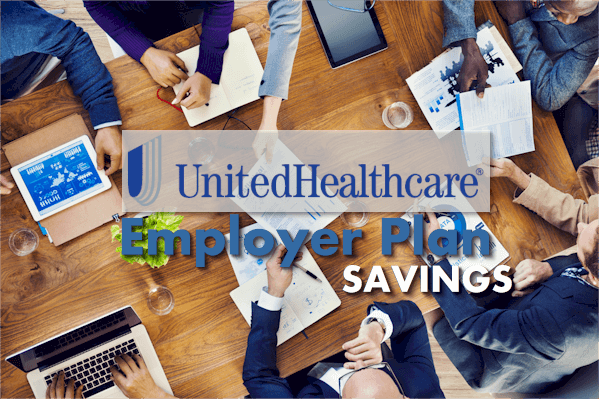 Here's where we can really offer savings to your employees. For Small Businesses (1-100 employees), we can offer a range of networks which affects the pricing. Each employee can pick and choose. Here's the landscape but let's understand a little better how cool this is! Many employer force you to pick one network or another. This one size fits all generally doesn't. Tell me you don't have a young employee (generally) who's invincible and just wants the lowest priced plan to avoid the penalty. Now maybe you have an employee who has serious health issues and wants the best doctors and benefits. We can address both with United Health networks. In fact, we have a few different networks we can offer depending on what you're trying to do (cost versus network decision). We can offer as few or many of the plans and networks as you like and I'll describe below how we go about doing this. The Core PPO Network plans are about 1/3rd the cost of the Select Plus PPO network. That's a huge deal for some employees that want to be more flexible on doctors so they can afford richer (or any) coverage. It might even allow them to get coverage for dependents (we'll discuss this in quoting section below). There are even cheaper networks than Core but Select Plus and Core are the most popular. 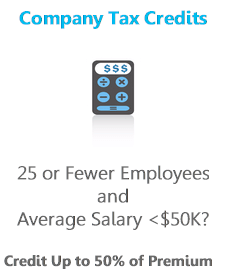 It's a question of cost and each employee will have their preference. The employer's budget is protected no matter what the employee picks! Let's look at this piece. It's the most important! So we're offering all these options to employees and they're loving it. What if an employee goes for the richest plan and the richest network? 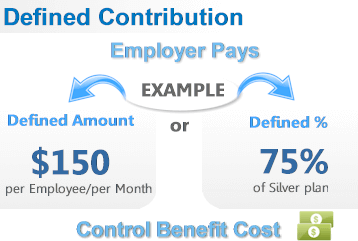 What about the employer's contribution? 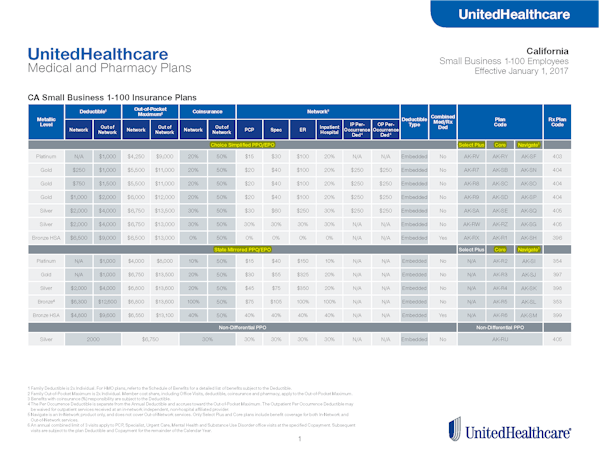 We can designate a defined % of a certain plan or a defined amount with United Health. Let's look at how this works and which option might be better. This works well when we have a wide age range for employees. A fixed amount of say $150 might be great if you're 25 years old (buys lots of coverage) but not great if you're 55 since age really drives health insurance premiums. Yes, each employee is getting the same amount but it's value very differently by the employee based on age. We can still reach the same goals. Here's what we do...once we have your census information (dates of birth and zip code, names are handy but not required), we can run the full quote. Based on the total amounts and a desired monthly budget from you (for each employee or for total company), we can fix a percentage to one of the plans to target that budget. We can even base the contribution % on the Kaiser plan (cheaper) and have that fixed amount also go towards the United plans. This protects the employer further since base rate originates from cheaper Kaiser plans. Otherwise, there's a defined amount. We can set it up so that any excess will go to dependents or not. It's up you as the employer. United Health offers full range of ACA compliant group health plans. We have a choice of multiple deductibles, copays, and max out of pocket options to choose from. In fact, we're looking at potentially 7 plans across 7 different networks. 49 potential options! Again, as the employer you can choose to offer as many or few of the United plans as you like all while capping your exposure with the contribution options above. What's a popular selection of plans for many groups? We can also add a Platinum level plan but too many plans can be overwhelming and the Gold is pretty rich. 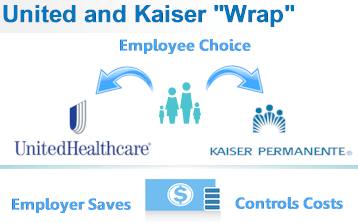 This will be on a second page and Kaiser offers a lower priced HMO option for those employees that want Kaiser or want to maximize their benefits with more flexibility in doctor choice. 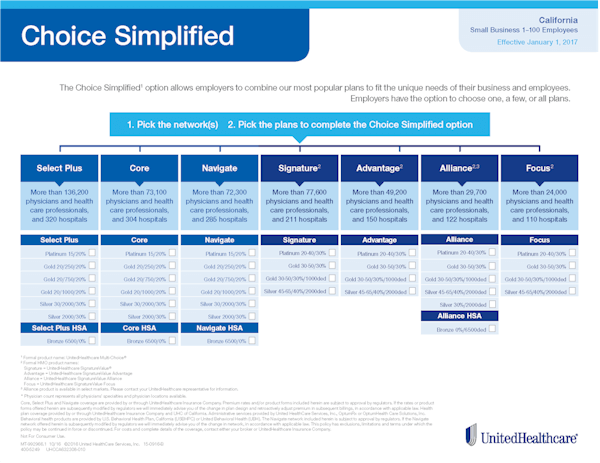 We create a worksheet for each employee that shows their cost by plan choice. Here's an example of what the worksheet would like based on 75% employee contribution of the United Silver plan. The 1st column is the employee's total cost after company contribution including dependents if quoted. The 2nd column is the employee only cost (and company contribution). It's actually great PR to show the company's contribution since many employees have a disconnect with the total cost of health benefits. It's good for them to see the actual cost to the employer. Appreciation jumps significantly. The 3rd column shows the dependent cost if quoted. We've jumped a head of ourselves a bit. Let's look at how we quote the new United options for you. Here's our plan...and our Service is completely, 100% free to you. We just need the census information. Now, we get to work! First, we'll run a full quote across all the major carriers in your area at the Silver plan. The Silver plan is the most popular and benefits are standardized +/- 2%. We'll quote the full networks again so we're seeing apples and apples. It really depends on what's available in your area. If there are regional carriers, we'll also include them such as Western Health Advantage, SHARP, and others. This summary report is great. We can now see who is priced best. Guess what. United will probably come up lower for PPO. Kaiser will be lowest for HMO. United's HMO for non-Kaiser doctors/medical groups will also probably be lowest. This first report is just to figure out who has the best value in your area. Once we have the lowest priced carrier pinpointed, we'll create the Employee Worksheet. This report shows a few different plans (strategy mentioned above) with the Employee cost. 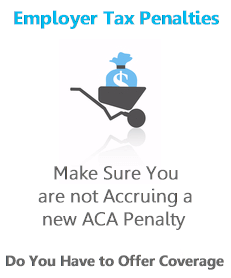 The employee can click on the plan name to get the benefit summary. Of course, we're there to go through the options with each employee privately. This is important so that they can get the best value for themselves based on benefits and costs. These two reports provide a great deal of information. We use the first one to find the best carrier pricing and to determine what the Employer's contribution will be. For example...Let's say the company wants to pay $2000/month for 10 employees. Let's say the Silver plan is $3000/month for the entire company. We can create a worksheet based on 66% of the Silver plan to hit this goal. The employees will then see different options with the defined contribution already taken out. They can down to the Bronze plan and save money (maybe even have 100% paid coverage). They can go up to the Gold and pay the difference (with pre-tax money). Okay...it's sounds like a lot but really, two clean reports. Complete budgetary control. Complete employee choice. Some final considerations with the United Health options. Here's some key tips to getting the most savings with United. Pop-125 allows employees to pay with pre-tax money. 20-30 savings for employees. Narrow networks can reduce cost by 1/3rd. We can offer full and narrow networks side by side with United. Huge deal. Let the employees pick the right plan. We can wrap Kaiser around United to offer total package. Your information is private and will not be shared with anyone. A final note about us. Who are we? Love to answer this question. 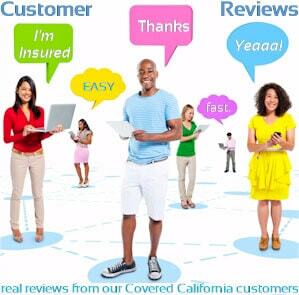 We are independent California health insurance agents. We have enrolled 100's of California business since 1995. We have relationships with companies that span decades now. Our services are 100% free to you. There is no better pricing available on the market. You can either request a quote below or request a secured email to send the census to. That's all we need to get started. Quote United Health Group health plans to view rates and plans side by side across all major carriers...Free.